Living a Fit and Full Life: My Bible Adventure Through God's Word: 52 Bible Stories for Kids by Johnny Hunt! My Bible Adventure Through God's Word: 52 Bible Stories for Kids by Johnny Hunt! 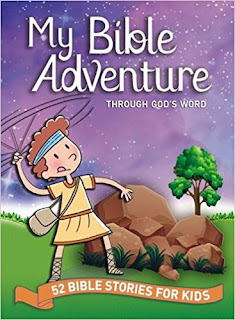 My Bible Adventure Through God's Word: 52 Bible Stories for Kids by Johnny Hunt is the perfect adventure for kids! My kids absolutely love the stories in this book and have been asking to read this book every night before bed. They also love to cute artwork throughout and I often find them just thumbing through the book to look at the artwork. I also really like that the stories are simple enough for early readers to begin reading on their own or with family before bed. It's a terrific way to practice reading! 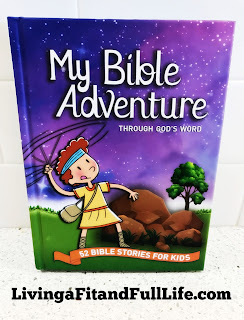 My Bible Adventure Through God's Word: 52 Bible Stories for Kids by Johnny Hunt is a terrific weekly devotional that truly encourages kids to pray and grow in faith! You can find My Bible Adventure Through God's Word: 52 Bible Stories for Kids by Johnny Hunt on Amazon, Barnes and Noble and other bookstores.